Get you minds out of the gutter. lol. In one corner, a dead garbage disposal. In the other, hubby. Weapons permitted: Wrench , Hammer, and Flashlight. Garbage disposal is the most recent kitchen appliance to go haywire in the BagMomma house (following the Microwave death, Refrigerator melt down, and Stove incident in the last month). Hubby turns on the switch. 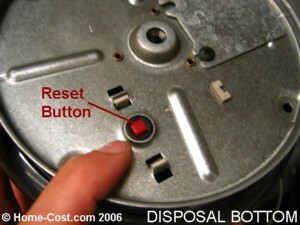 Garbage Disposal hums, then dies. All is silent. Hubby presses the reset button. Garbage disposal is mocking him and only makes a faint humming sound. Take that!! Hubby grabs his weapons from his tool box. Garbage disposal is nervous as hubby gives it the stare down. Hubby uses wrench and hammer to knock sense into flywheel of garbage disposal. And I am grateful I don’t have to call appliance repair man for the 4th time this month. So goes another evening in the BagMomma house. p.s. for those of you who have been following my kitchen appliance meltdown tally, the only appliance which has not needed repair in the last thirty days is the dishwasher. My conclusion: new appliances which are now cheaply made within the confines of the Asian continent have a lifespan of EXACTLY 7 years. Be warned. I’m a little nervous that you just said that about the dishwasher…I hope it didn’t hear you, or it may be next.